From AdoptionToday article: "Outgoing Adoptions: Controversial, but the world is a small place..."
By Kimberly S. Cooper, Esq. reflecting on a workshop given by Michael S. Goldstein, Esq., LCSW, and Joy S. Goldstein, LCSW, ACSW. When The Hague Adoption Convention on the Protection of Children and Co-operation in Respect of Inter-Country Adoption, also known as “The Convention” entered into force for the United States on April 1, 2008, international adoptions in the United States changed drastically. The Convention provides a framework for countries that are signatory to it to work together to ensure that intercountry adoptions take place in the best interests of children and to prevent the abduction, sale or trafficking of children in connection with intercountry adoption. 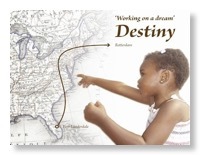 The current adoption climate has created new opportunities for adoptive homes abroad. Often, people will question why and how, or just ponder the thought of children from the United States emigrating to another country. This past August, during a workshop presented at the North American Council on Adoptable Children’s 37th annual conference, in Denver, Colo., Michael S. Goldstein, Esq., LCSW, spoke with his wife Joy S. Goldstein, LCSW, ACSW, executive director of Forever Families Through Adoption, Inc., a Hague accredited agency, about outgoing adoptions from the United States. While explaining how expectant parents choose to place children outside of the United States, it became more evident that, while outgoing adoptions can be controversial, all of our goals remain the same — to create permanency and forever families. The Goldsteins started the presentation by giving background on The Convention. An intercountry adoption case is considered an outgoing Convention case if it has all of the following components: The child being adopted is a habitual resident of the United States; The prospective adoptive parents are residents of a foreign Convention country, where they will move the child after adoption in the United States or plan to move the child out of the United States for the purpose of adoption; The prospective adoptive parents initiated the adoption process by applying to the Central Authority, the government entity in charge of adoption, in their country of residence on or after April 1, 2008 (the date the Convention entered into force for the United States). The presenters further explained that, once it is determined that a case is an outgoing case, only the following providers can offer or provide an adoption service in that case in the United States: a Hague accredited agency, a Hague approved person, a supervised provider, an exempt provider or a public domestic authority. Currently in the United States, there are 21 approved/accredited outgoing providers. Michael S. Goldstein, Esq. is one of only three attorneys nationally approved by the Council on Accreditation to provide both incoming and outgoing adoption services under the Convention. During the past 30 years, Michael has been involved with more than 2,500 successful adoptions, which include international, domestic, agency, single parent, two parent, second parent and foster care adoptions. He and his staff have helped successfully supervise approximately 100 outgoing placements since 2008. To answer this question, the Goldsteins distributed amended Guidance on 22 CFR 96.54 to the attendees. The U.S. Department of State, our Central Authority, released the amended guidance in March 2009, which states that U.S. adoption providers are not required to prove that there are no American parents to adopt an American child (subsidiarity principle). Instead, providers are required to prove that the expectant parents have selected the PAPs freely and without being influenced to do so. 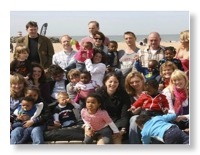 This interpretation has allowed for additional placement options of non-U.S. citizens as prospective adoptive parents. While the expectant parents have authority to make the placement decision, the judge in the United States must still affirm such choice by weighing the considered placement options with other factors to decide what is in the best interests of that child. During the presentation, the Goldsteins spoke about their positive experiences working with prospective adoptive parents overseas as well as the need to place children in safe, loving and permanent homes no matter where these homes may be. They challenged the common opinions against outgoing placements that outgoing placements pose the risk of children losing their identities and cultural ties and other concerns by sharing pictures and wonderful stories about the gatherings that often take place to celebrate American holidays and traditions in communities and countries of families who have adopted from the United States. On any given day in North America, approximately 450,000 children are in the foster care system, and nearly 129,000 of them are available for adoption, just waiting for the right family to find them. Each year 26,000 kids age out of the system at 18 years old without being adopted, according to statistics from www.adoptuskids.org. Children may have been removed from their homes as victims of child abuse, neglect or abandonment and are left without a family. Although most of the placements from The Law Offices of Michael S. Goldstein, Esq. are of U.S. born infants, they have been chosen to be on a team of professionals who are trying to open up the U.S. foster care children to approved prospective adoptive parents in countries outside of the United States. It should be noted that, although currently almost 80 countries signed the Convention, not all countries accept the U.S. interpretation of the Convention. We are hopeful that discussions will continue between the U.S. Department of State, American service providers, and foreign governments to keep open dialogue on this issue surrounding the Convention, including outgoing adoptions, keeping the best interest of children as the utmost priority. Joy S. Goldstein, LCSW, is the adoptive mother of three, and the executive director and co-founder of Forever Families Through Adoption, Inc., a New York and Connecticut licensed adoption placement agency and resource center. FFTA is also accredited by the Council on Accreditation to provide incoming and outgoing adoption services under the Hague Convention. Joy is also the social work supervisor and adoption consultant for the Law Offices of Michael S. Goldstein, Esq. In her capacity, during the past 30 years, she has counseled thousands of birth parents and adoptive parents, and has been involved with more than 2,500 successful adoptions. Michael S. Goldstein, is an attorney, social worker and adoptive father of three who concentrates his practice in adoptions. During the past 30 years, Michael has been involved with more than 2,500 successful adoptions, which include international, domestic, agency, single parent, two parent, second parent and foster care adoptions. Michael is affiliated with AAAA, NYAAFF, APC, JCICS, co-founder of Forever Families Through Adoption, Inc. and a recipient of the 2006 “Angel in Adoption” award. Michael is one of only three attorneys nationally approved by the Council on Accreditation to provide incoming and outgoing adoption services under the Hague Convention. Kimberly S. Cooper, Esq., joined The Law Offices of Michael S. Goldstein, Esq., in September of 2009. She obtained her J.D. in 2009, and earned a bachelors degree in psychology. While in law school, she interned at the Pace Women’s Justice Center, at The Westchester County Family Court. As an associate at The Law Offices of Michael S. Goldstein, Esq., Cooper has been involved with international, domestic, agency, single parent, two parent, second parent, and foster care adoptions, and has presented workshops on topics related to adoption. She is The Firm’s Canadian and European Hague Convention Compliance Officer.